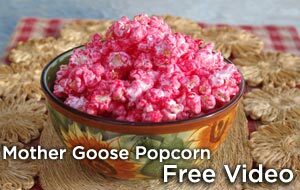 See the video of Dan and Linda making Mother Goose Popcorn. Click here to watch the video. If you have a slow Internet connection, click here to see lower-quality video clip. Preheat oven to 450� F.
1. In a small bowl, toss the parsley, lemon zest and garlic together. 2. Fold the foil in half and crease down the middle. Open it back up. Divide the scallions into fourths and place each bundle on the right side of the fold. 3. Place the fillets on top of the scallions and top each fish with some of the parsley mixture. 4. Sprinkle the fish with the lemon juice and dot with the butter. 5. Fold the left side over the right and fold and crimp all around the packages, sealing tightly. 6. Place on a rimmed baking sheet and bake for about 8 minutes. The packages should be slightly puffed up. Place a packet on each plate and serve. The fish packets may be made up to 4 hours ahead. Allow to rest at room temperature at least 15 minutes before baking.